Be the first to share your favorite memory, photo or story of Brooks. This memorial page is dedicated for family, friends and future generations to celebrate the life of their loved one. 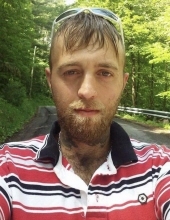 Brooks Allen Parks, 32, a resident of Beckley, passed from this life Sunday, February 3, 2019. He had been in his usual health and death was unexpected. Brooks was born Friday, August 1, 1986, in Elkins, a son of Irvin Parks and Tina Louise Mallow Parks who survive in Elkins. Also left to cherish his memory are maternal grandparents, Billy and Agnes Mallow of Elkins, aunts, and uncles, Kevin Parks and wife Bonnie of Beckley, Joe Parks of Elkins, Debbie Cowger and husband Dean of Beverly, Michelle Simms and husband Mickey of Montrose, and Loretta Bowers of Martinsburg. Preceding Brooks in death was paternal grandparents, William and Charlotte Parks, and uncle, Phil Mallow. Brooks attended the schools of Randolph County. He had been employed at Multiplex Inc. in Summersville and JC Construction in Beckley. Brooks loved the being outdoors hunting and fishing and especially enjoyed doing construction with his Dad. The family’s request for cremation will be honored and a memorial service will be held at a later date. To send flowers or a remembrance gift to the family of Brooks Allen Parks, please visit our Tribute Store. "Email Address" would like to share the life celebration of Brooks Allen Parks. Click on the "link" to go to share a favorite memory or leave a condolence message for the family.